Works on battery or mains power. 45 minutes autonomy for only 26.5 kg. BATFAN 2 is the most versatile battery-powered fan on the market. It can be used for PPV (offensive, defensive, combined), blowing, extraction and it can be transformed into a foam generator or rehab misting device. Lightweight and equipped with a carrying handle and strap, it is portable by one person. Folds up and stows easily in the trunk of a vehicle. Two BATFAN occupy the space of one conventional fan. 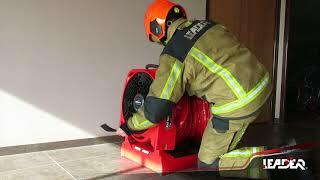 Equipped with one NiMH battery, BATFAN 2 allows independent fire operations.